Representatives of Britain's bookstores have made a desperate plea for help, as they face extinction at the hands of Amazon's cheaper prices and uncanny ability to avoid paying much tax. 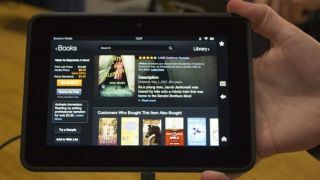 The Booksellers Association, which represents over 1,000 outlets in the UK, said it needs help from the government to stand up to Amazon's "relentless expansion" that's putting shop owners out of business. The group's CEO Tim Godfray told the Guardian than one bookshop a week is closing its doors (73 in the last year) and more face the same fate if nothing is done about Amazon's dominance. Aurélie Filippetti told booksellers at a speech in Bordeaux: "Everyone has had enough of Amazon, which by dumping practices, slashes prices to get a foothold in markets only to raise them as soon as they have established a virtual monopoly. "The book and reading sector is facing competition from certain sites using very possible means to enter the French and European book market... it is destroying bookshops." The French are even considering banning Amazon from offering free postage on books in the country in an attempt to restore an even playing field for its homegrown retailers. The retailer has recently come under fire in the UK amid allegations of tax avoidance, that assist its ability to keep prices much lower than the competition.